We are often asked by new members, prospective new members and even by other genealogy societies about events and subject matter that we provide at our regular monthly meetings. Below is a list of activities for 2019. 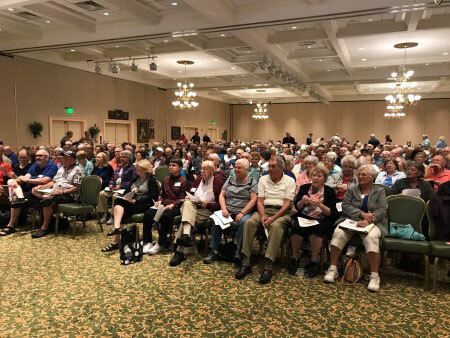 The Villages Genealogical Society sponsored on a “Genealogy Cruise” for our members and friends. ANCHORS AWAY Travel Agency, here in The Villages, was in-charge of our cruise and cabin reservations. On a cold Thursday January 31, 2019, we had a wonderful visit from the folks at MacKiev Software, producers of Family Tree Maker 2017 Software. Three - 3 hour sessions were full of eager members wanting to learn more about the software and other products that work along-side of Family Tree Maker. Maureen Taylor, "the Photo Detective" was the keynote speaker. Besides talking about different types of pictures that may be found of our ancestors, she talked about the photo darkroom that is part of Family Tree Maker 2017. There were also presentations on using Family Tree Maker, using the Charting Companion 7 software and using the plug-in Family Book Creator. Many members left the conference with new software that was available for purchase at a discount. On Wednesday January 23, 2019, we had 325 members in attendance an another 50 tuning in via the internet. Today's guest speaker was Diahan Southard via a live webinar. Here well received presentation was "3 Ways To Find Your Best DNA Matches"
​She pointed out that your ethnicity results have three components: Reference Populations, Fancy Math, and Time. That means that if a particular company doesn't have a good representation of the population you come from, they are going to have a difficult time providing a good result for you. The Handout is now online and the Webinar will be available online soon. "Members Only" > "Webinar & Meetings"